When I saw the pictures of this house I knew what it would be one of my favorite posts that I have done in the past 5 years! I just love the style and the setting of this house. I love every room in this house but the gorgeous outdoor areas are my favorite. 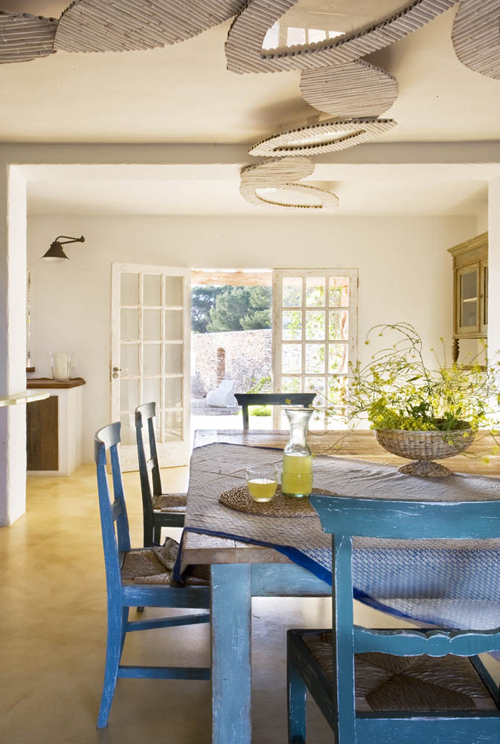 This stylish house is located on the Spanish Island of Formentera and is owned by a lady called Rita. 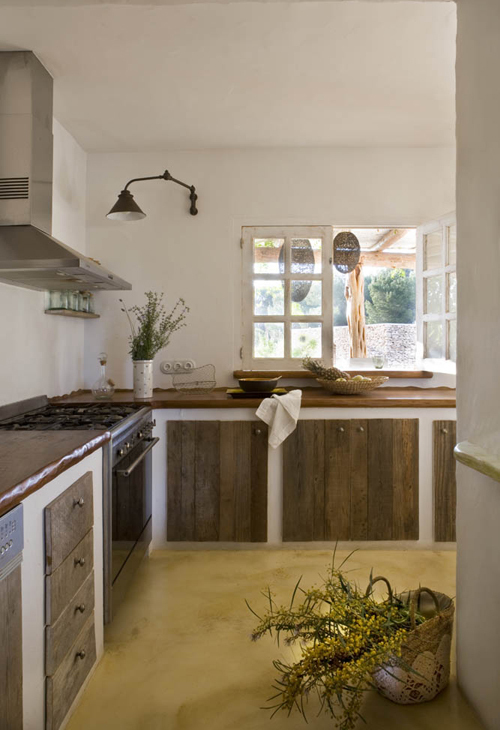 Wooden kitchen cabinets and white walls: a beautiful combination. 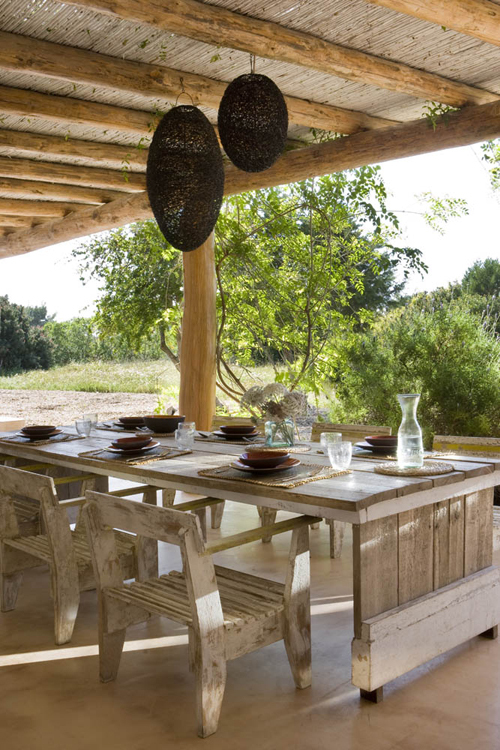 The use of natural materials and the choice of furniture and accessories suit this house perfectly. I hope you have enjoyed this beautiful house as much as I have! Happy Friday everyone! 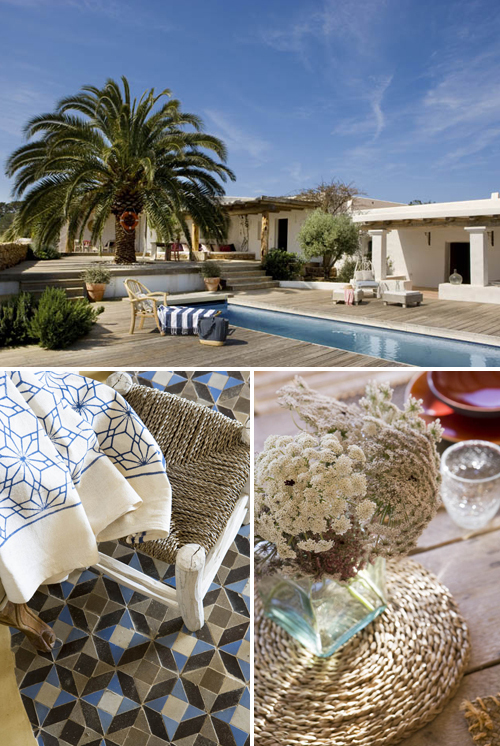 Splendid!I lived in Ibiza,but Formentera is something else..picture perfect!! You are so right….stunning! It looks so tranquil. wow these pictures looks very otantic. I love these pictures and is fascinating colorful. I love this place! Thanks for the inspiration! I am so so jealous of the owners of this home.. this is like my dream home! 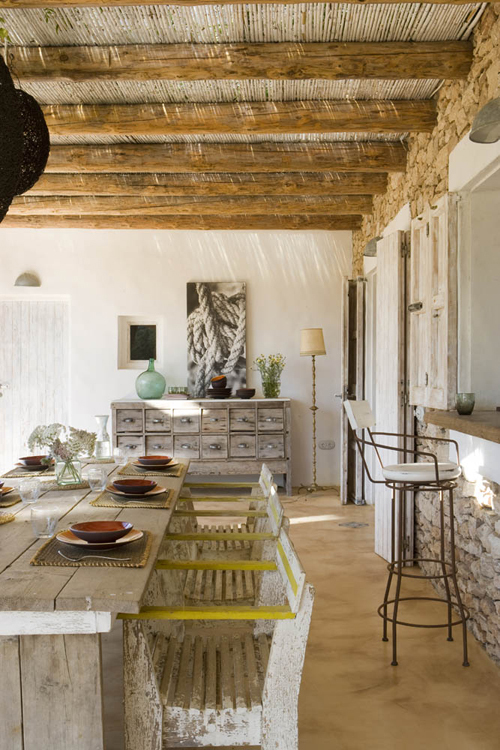 I love the rustic kitchen with the modern oven and the wooden beams and the living room and everything!!! Just love it. Any information on the furniture?Particularly the chairs with the yellow arms, the dining tables, and the ottoman in the outdoor area? 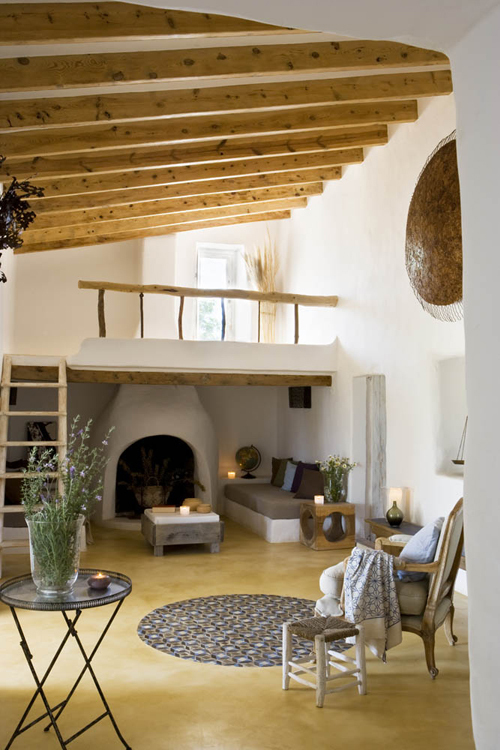 Love the area around the fireplace, and the rooms and benches around the pool look so comfortable! Would be a great place to spend one’s holidays there! Every area of this house feels cosy, especially the outdoor.. Nice place to read a good book. What a great home – I love the patio and pool area. You are absolutely right – I am in love with this house immediately…. Looks like paradise… I especially love the high-ceilinged room with the beautiful loft–nothing at all like the “loft-style apartments” here in NYC! Each detail is absolutely perfect..
Wow, some people do have it all. Amazing! Love every single bit of it. Looks so beautiful, I want to see immediately fly past. 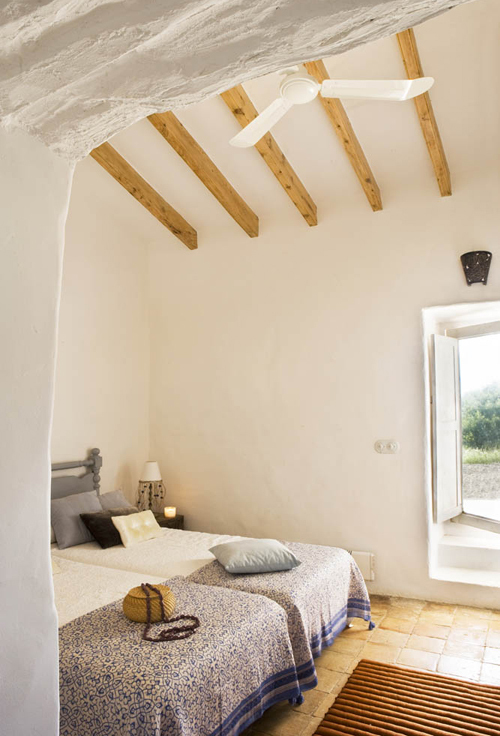 Pingback: Display of Exquisite Traditional Details in a Spanish Island Home :: DesignInterior.US Online Magazine :: More than 16000 Photos in catalogue. Ideas for home design.